Rolling and decorating beeswax candles is a simple way to create beautiful and natural candles for your home, or to make pretty gifts for your friends and family. Beeswax is easy to work with and smells great while it's burning. Most beeswax candles are rolled rather than poured because of the way in which beeswax is sold. Other candle waxes come in slabs, chunks, bags, or pellets, but beeswax is unique in that it can be purchased in standard-sized sheets. The easiest and prettiest way to make candles from these sheets is to roll them around a wick. While this method might seem limiting at first, you can create all kinds of interesting designs and shapes with rolled candles. You can also add interest by decorating the finished candles with candle paints, ribbons, colored wax, and all kinds of trinkets or adornments. The best way to learn how to roll a beeswax candle is to just jump right in and try a few. In order to save some money on supplies, cut your beeswax sheets in half lengthwise to make short candles at first. Once you get the hang of it, then you can start to make larger candles. Here are the basics of beeswax candle rolling. Measure the candle wick and trim it to be about 1.5 inches longer than the width of the beeswax sheet. Place the wick flush with the end of the beeswax, centered so that there is equal overhang on both sides. Fold the edge of the beeswax over itself just enough to cover the wick, and press down firmly to completely enclose the wick. Begin rolling the wax from the wick end, going slowly and carefully. Do not press the wax, or you'll end up with an uneven roll and you'll damage the pattern of the wax. As you roll, check both ends to make sure they're even and straight. Continue rolling until you get to the end of the wax. At this point you can seal the edge with the warmth of your hands, or, if it just won't stick, warm the wax slightly with a hair dryer set on low. Press gently until the candle is sealed. Choose which end of the candle looks most attractive - this will be the top of the candle. Trim the extra wicking from the bottom, and your candle is ready to light right away. Rolling and decorating beeswax candles is a great craft project for all ages. Now that you've mastered the rolling, it's time to decorate! Here are some ideas to make your rolled candles stand out. Tie small charms or other trinkets to one or more candles with pretty ribbon. For a more natural look, use raffia instead of ribbon and tie on small pinecones, sprigs, or flowers. Use candle paints, available at craft supply stores, to paint stripes or other designs. Cut shapes or "ribbons" from other colors of beeswax sheets and attach them to your candles by gently warming them with a hair dryer, and pressing them onto the finished candle. Decorative pins can be pushed into the candles in different patterns. Just be sure to trim the pins first if they are longer than the width of the candle. Cut a second sheet of beeswax half the length of the candle. Roll and seal this sheet in the same way as you rolled the candle, flush with the bottom half of the candle. This will result in a tiered look, and can be especially pretty when using complimentary colors. Beeswax is a wonderful base for candles, as it's a natural product that is widely available to candle makers and craft enthusiasts. You don't need any special equipment and there's no need to melt the wax first. 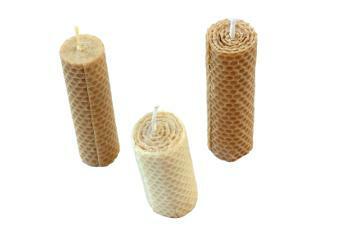 The added benefit to making rolled beeswax candles is the heavenly scent they emit when you light them!